Special thanks to Kat Mayerovitch for this guest post. Cooperation and collaboration are concepts that have been drilled into our heads since Kindergarten. Whether we’re talking about launching a beach ball into the air with a multicolored parachute or kickstarting a new massage business, there’s no doubt that a cooperative framework is more effective than a strictly competitive one. Still, we’ve got an awful habit of seeing cooperation that occurs only within our own kind. While it can be difficult to explain to children that yearlong battles of girls vs. boys for playground turf aren’t actually as productive as using the jungle gym together, adults need to be able to see the forest as well as the trees. As massage therapists, reaching out to those outside of our immediate field is an important skill, especially when we’ve got the same goal in mind. Who shares a goal with massage therapists? Many people do, but one of the most notable groups are physicians. They can be intimidating to speak with at times; they have their own language, their own priorities, and a level of education that many (but not all) people in the massage field never plan to attain. But given that we both want to see our clients leading healthier and more pain-free lives, shouldn’t it be possible to bridge this gap? Even if you do not have a medically-focused practice, your clients still have doctors. Wouldn’t it feel great to know how to collaborate with them for your clients’ well-being, should the need ever arise? Given the price (free! 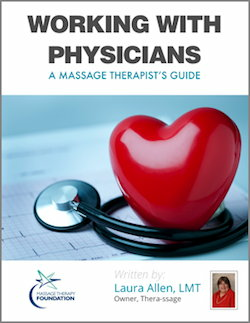 ), there’s no excuse not to add this insightful guide to your massage therapist’s toolbox. We’re better together! Learn how to reach out of your comfort zone, and see for yourself how great the rewards can be. Kat Mayerovitch is an AMTA Ohio chapter member and licensed massage therapist practicing in a nonprofit chronic pain management center in Cleveland. She also works as a copywriter, volunteers like mad in local community development, and plays the ukulele. If you like her writing here, Kat writes more good stuff at LMT or Bust.